This year’s theme for BLD is “Everyone’s A Leader”. No matter what your title or role, as B Corps, we are in an especially unique position of truly walking the talk and exemplifying what it means to do well and do good. Our conference allows everyone to have an equal voice, so let’s learn the skills and tools that we need to share that story and inspire others! BLD is an all-day conference designed by the B Corp Ontario community to dig into how we can drive value beyond certification. Now in its third year, we are keeping the momentum going with this year’s event being hosted at the historic Palais Royale on Toronto’s waterfront. The B Corp Leadership Development (BLD) Day is a time for ideas, collaboration, and thinking big. Come roll up your sleeves and dig in with us. You’ll leave with practical know-how, actionable insights to last you throughout the year. The day features key note speakers, workshops and hands-on business challenges. Keep your eye out for updates. Thinking of becoming a B Corp? 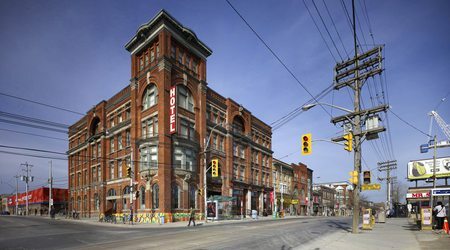 The night before our conference, we are planning an evening of networking at the Gladstone Hotel. This will be an opportunity to invite and engage with the broader community. Come mix and mingle – learn more about what it means to be a B Corp and use business as a force for change.